The 2018 campaign slogan was ‘Give HIV the finger: a finger-prick test is all it takes’, a continuation of the successful creative from 2017. These briefings provided information about the benefits of HIV testing and supported HPE stakeholders to get involved. 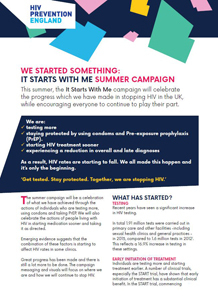 Information briefing on the summer phase of the It Starts With Me campaign, which focuses on combination prevention, and starts on Monday 18 June 2018. 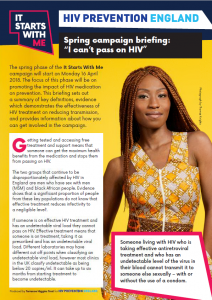 Information briefing on the next phase of the It Starts With Me campaign, which focuses on HIV treatment and how it stops the transmission of HIV. Information briefings on National HIV Testing Week 2017. In the UK, people are testing more and using different 'combination prevention' approaches to stop HIV. However, late diagnosis is still a concern and HIV testing continues to be key in stopping HIV. National HIV Testing Week provides amplified opportunities for people to get tested. 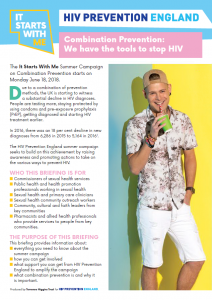 These briefings contain more information about the benefits of HIV testing, the support which HIV Prevention England can provide to you, and how you can get involved. Information briefing on the summer phase of It Starts With Me. This summer, we are celebrating the progress which we have made in stopping HIV in the UK, while encouraging everyone to continue to play their part. Information briefing on the next phase of the It Starts With Me campaign, which focuses on combination prevention strategies to stop HIV. Information briefing on National HIV Testing Week 2016. Contains more information about the benefits of HIV testing, the support which HIV Prevention England can provide to you and how you can get involved. The national campaign has gone through a refresh. This briefing includes an update on the development process, details on upcoming campaign activities and other useful information. This briefing includes information on campaign videos and updated information about Treatment as Prevention (TaSP). 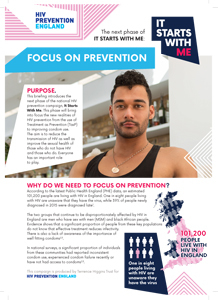 This campaign briefing includes information on the 2015 national HIV Prevention England conference and an update on National HIV Testing Week. The rationale behind National HIV Testing Week and how to get involved.